if you’re someone who believes the same or would love to experience this feeling, then all you have to do is add these 10 Spanish festivals to your bucket list and attend them all as soon as you can. After all, it’s always better to do the best things tomorrow than never, right? 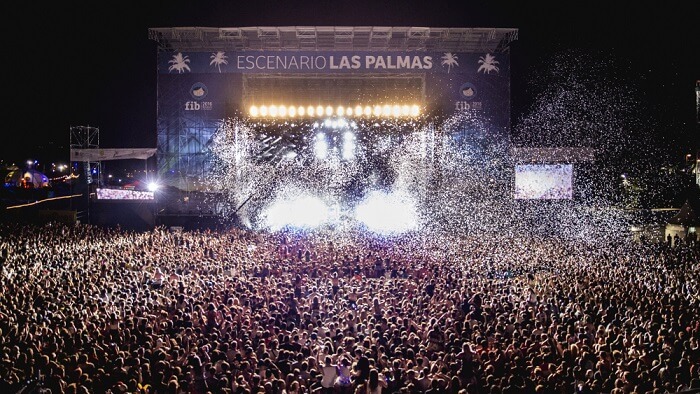 10 Festivals In Spain That You Need To Attend ASAP! Spain is a beautiful country with an even more beautiful culture. So, there are innumerable festivals and events that take place throughout the year in the country. However, if there’s anything that needs to be on the top of your bucket list, it is these 10 most famous fiestas. Just scroll down and get ready to go crazy! Thanks to Zindagi Na Milegi Dobara, we all know what craziness La Tomatina is! 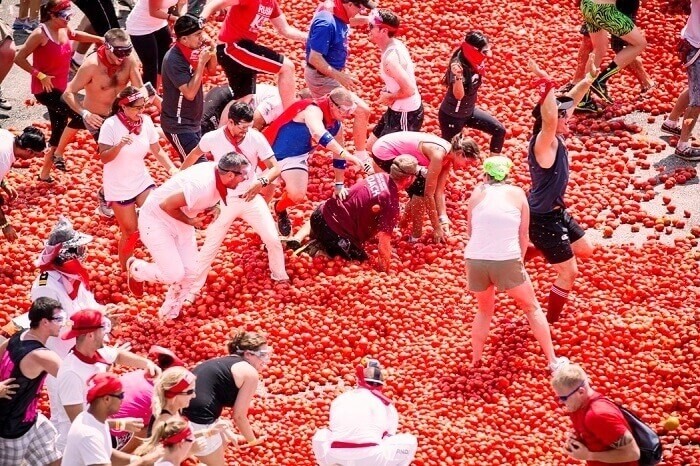 During this tomato festival, Spain heartily welcomes thousands of locals and tourists to the streets of Bunol who then smash and throw tomatoes at each other. Started some 70 years ago, this fiesta has now become such a popular event in the country that the 20,000 tickets get sold out in a jiffy. So, if you too wish to paint the town red or just want to be a part of this fun tradition, make sure you put this Spanish festival on the top of your bucket list! Explore the most beautiful places to visit in Europe, from Paris to the Venice canals and from the Greek islands to the Swiss alps. Book customized packages by expert agents on TravelTriangle. Inclusive of airport transfers, cab, resort, sightseeing and meals. Best holiday experience Guaranteed. 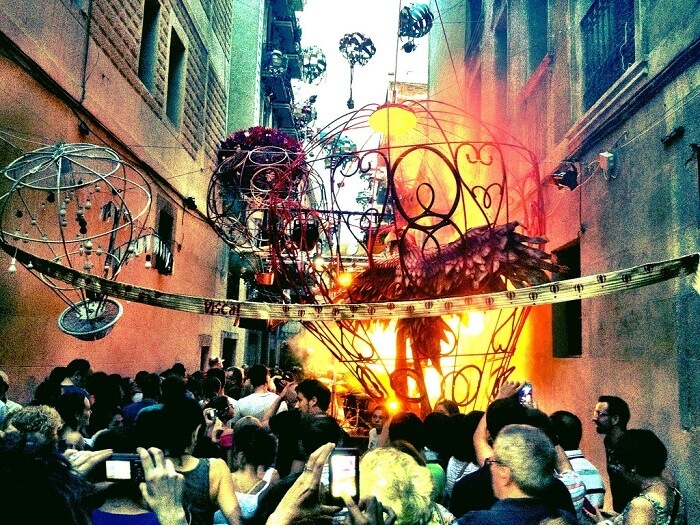 No list of Spanish festivals can ever be complete without mentioning the Fallas in it! 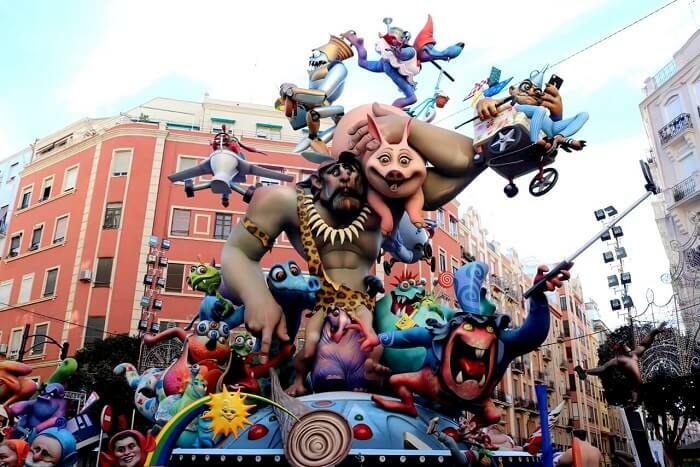 Literally, a party that takes place for five days in the city of Valencia, this festival brings gigantic colorful characters out on the streets. Most of these statues or figures are mostly a result of satire or pop-culture events that have happened throughout the year. Apart from witnessing the Fallas on your way, the major highlights of this fiesta are the spectacular shows & fireworks that take place during the day, and the light show on the last night. 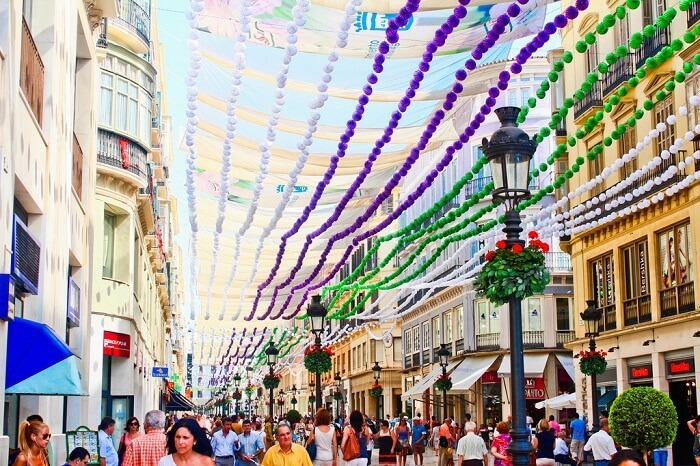 Amongst all the fascinating Spanish traditions and festivals, the April Fair of Seville is one event that would definitely make you fall in love with the country’s culture. This week-long fair begins with the traditional lighting of the entrance to the fairgrounds at midnight and ends with entertainment, colors, and best of Andalusian art like flamenco. All you have to do to make the most of this festival is dress up like the locals, head out to the fair, and enjoy every moment like never before. 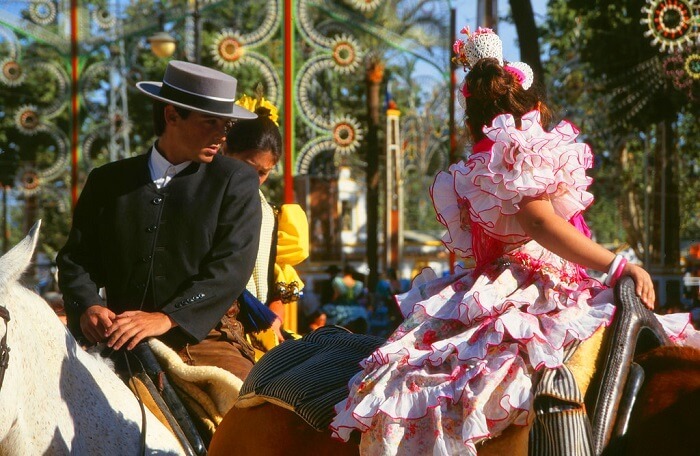 Joyous celebrations, flamenco performances, Andalusian cuisines, and a lot of horses is exactly what all the Horse Fair in Jerez brings under the spotlight. 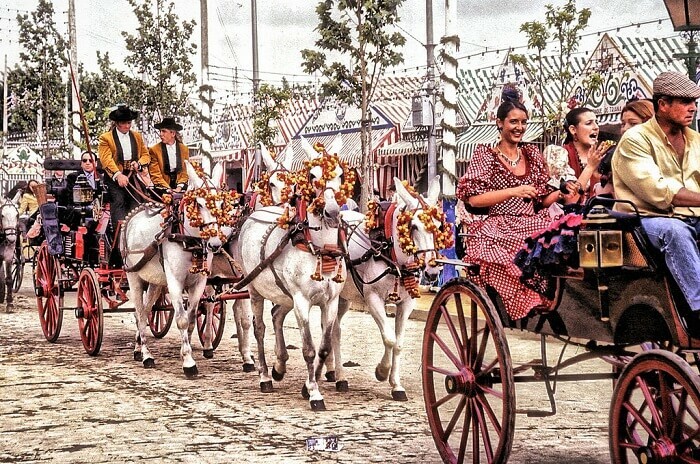 One of the major festivals in Spain in May, this fair helps everyone come together to enjoy the horse parades and indulge in tapas being sold at over 250 stalls. While dressing up like the locals is one of the important things to do, another is to enjoy this cultural tradition to the fullest! Popular as the best Spanish festival in August, the August Fair of Malaga is a week full of ultimate fun activities and events in the heart of the Costa del Sol. You can attend this fiesta both at day or night and have a summer holiday in Europe like never before. Needless to say, if you visit this fair, you will surely have the time of your life. If you think Barcelona is one gorgeous place to visit in Spain, you’ll be amazed to see it in prettier colors during this summer festival. The whole of Gracia neighborhood comes together and splash artsy colors all around to compete & win for the most extravagant decoration. Apart from this, there are also parades, acrobats, and fireworks on the streets. Witnessing this mind-boggling creativity in every corner all at once, you’d surely be transported to a different world. So, don’t miss out this Spanish festival at any cost! 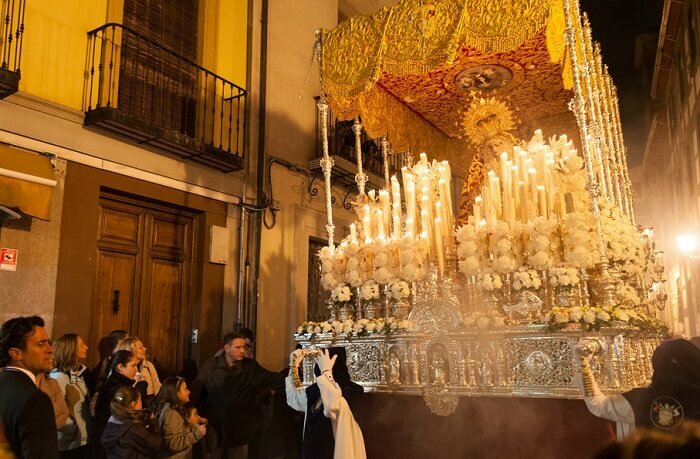 One of the most famous traditional Spanish festivals, the Semana Santa or the Holy Week takes place during the Easter. It is a week full of processions and other religious events. A dozen of men and women come out to march through the streets, whilst carrying the statue of their church’s patron saint surrounded by hundreds of candles. Even if you’re not so religious at heart, make sure you attend this festival at least once in your life because seeing all the families come together with their chairs & snacks is surely a golden sight. Held for a week every year at the starting of the month of July, the San Fermin or the Pamplona Bull Run is amongst the most popular festivals in Spain in July. 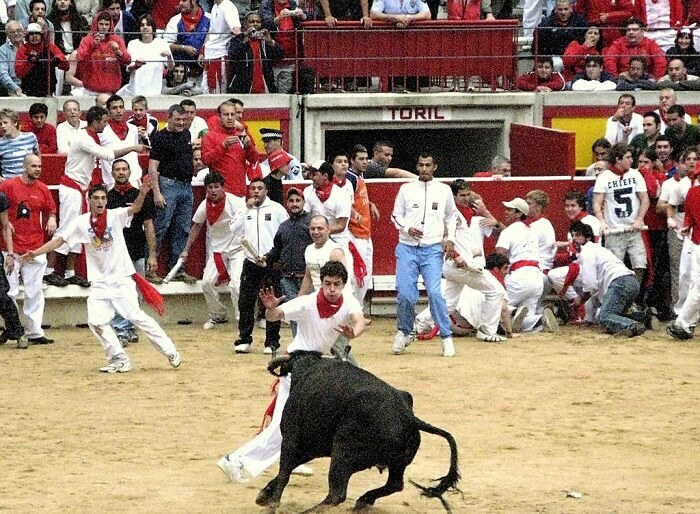 This event of bull running and bullfighting begins at 8 in the morning every day and welcomes the most brave-hearted and adventurous people to run ahead of a group of angry bulls. Even if you aren’t so daring at heart, make sure you at least visit the city to witness this mind-boggling scene that will leave you amazed! 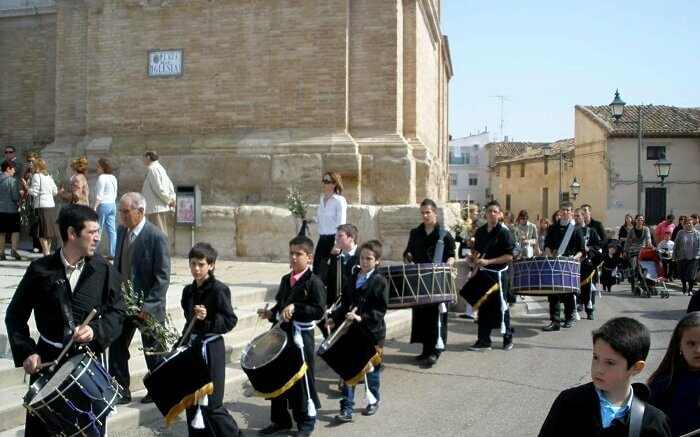 This Spanish festival is certainly the noisiest one in the country and may even come across as bizarre to some. But, if you’re a drum lover or have always wanted to try your hands on one, then this fiesta is where you need to be when a new year starts. Huge parades of men, women, and kids come out on the streets and bash drums throughout the night and day for 24 hours. While one side of this festival has the organized processions, the other side has free-for-all drum bashing which you can easily join and become part of the fun. Of all the Spanish music festivals, Benicassim is the four-day event which you ought to be a part of at least once in your life. Held in Benicassim on the east coast of Spain between Valencia and Barcelona, this festival brings all the popular bands and artists on stage. If music is what gets you high and Spain is where you always dreamt to be, then do make sure you take a trip to Spain in July. Enticed already? Well, we don’t blame you. The country of Spain, its culture, and people do make it stand out on the map and make travelers feel truly at home. So, don’t think much, add Spain to your Europe holiday package and get ready to be a part of the ultimate fun. Ve a vivir su vida!